Teacher: So with so many social and medical advancements we can bring to the Independents why would they fight so hard against us? River: People don't like to be meddled with. We tell them what to do, what to think. Don't run, don't walk. We're in their homes and in their heads and we haven't the right. My daughter has a weekly art class. It fell to me to pick her up last night and, at 8:55pm, I was approaching the intersection of Hamilton Mill Road and Buford Highway. A Gwinnett County police car, heading southwest, was stopped for his red light. As I was just about to enter the intersection the cop started rolling into my path. I had the green light and his blue lights were not on. I laid on the horn, slammed on the brakes, burned rubber, and left skid marks -- but I avoided hitting him. I think my car stalled. As I cranked it back up, I saw that the policeman had stuck his left arm out his window and had raised it, perhaps as a gesture of “sorry” or, perhaps, “go on.” I didn’t want to leave my daughter waiting so, with racing heart and gnashing teeth, I continued on to her art studio. It’s obvious the policeman knew he was in the wrong as no blue lights followed me. What I should have done was gotten the cop to pull into the parking lot of the new city hall and demanded to see his license and registration. Maybe bluff my way through having him take a field sobriety test. Maybe even calling 911 to ensure he was given a ticket for reckless endangerment. If the skid marks are still clearly visible tomorrow then maybe I’ll memorialize this incident with a picture or two. 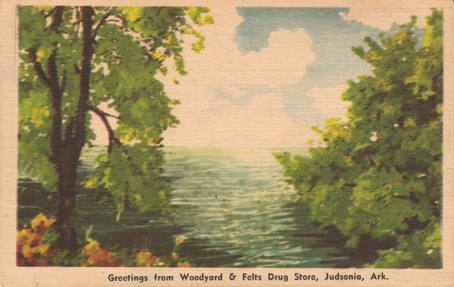 My grandfather’s obituary noted, “After his graduation in 1914 he came to Judsonia as an associate of the late Dr. W. H. L. Woodyard.” A biography of Dr. Woodyard notes, “He is now associated with W. R. FELTS, of whom he had been a partner since 1913...” Once again, we are faced with differing dates. In any case, I was lucky to find a set of four vintage postcards for sale on eBay, one of which was listed as being from “Woodyard and Felts, Judsonia Arkansas”. Fortunately, no one bid against me. Click the pictures for higher resolution images. Note that the postmark is dated November 7 (or 17), 1914. I don’t think that helps resolve the date either way. 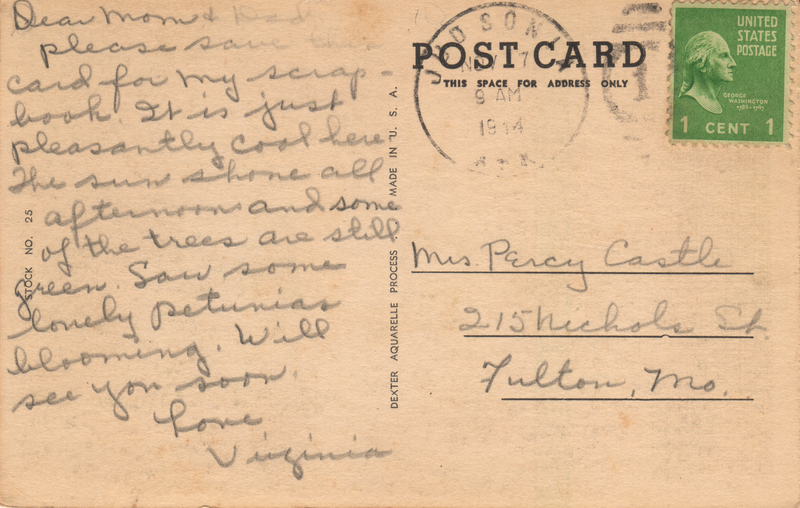 Google shows that a Percy Castle of Fulton, Missouri was in the Supply Company, 349th Infantry, 88th Division, US Army. When was my Grandfather born? My grandfather’s obituary listed both 1887 and 1889 as his year of birth. 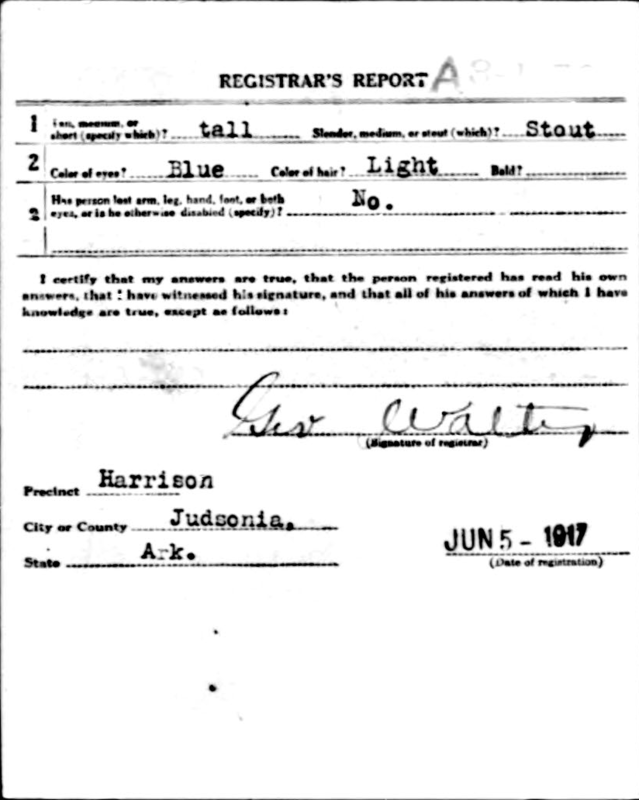 His World War I registration card (part 1, part 2) shows 1890. 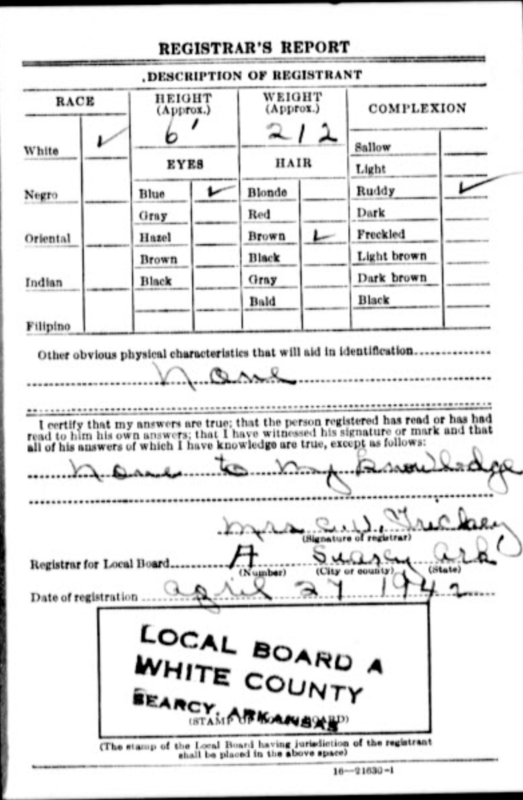 His World War II registration card (part 1, part 2) also shows 1890. His marriage certificate notes that he was 29 in 1920. Because he was married on January 29 he would have turned 30 on his birthday on March 29. 30 years before 1920 is 1890. On the other hand, according to my sister, the family bible, his death certificate, and the estate tax forms filled out after his death show 1889. To further complicate matters, the entry from my father’s diary, dated March 29, 1950, reads: “Dad's 59th BD”. 1950 - 59 is 1891! We know that people would often fudge their age to join the military or to get married; but in this case those reasons don’t apply. One year’s difference wouldn’t have affected either his military or marriage eligibility. There is no clear weight of evidence to decide in favor of either 1889, 1890, or 1891 so this will have to remain a mystery. From a newspaper clipping found inside the family copy of That’s Judsonia by W. E. Orr. 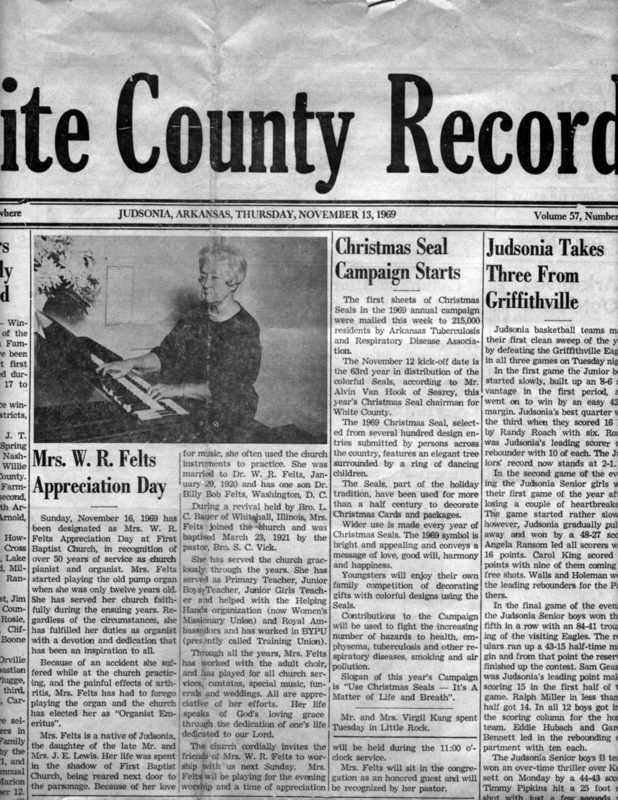 The paper was most likely the White County Record from 1977. Billy Bob Felts, who has been visiting aunt and uncle, Mr. and Mrs. Roy North in Washington D. C. the past month, sailed Saturday with Mr. and Mrs. North and family for a visit to the West Indies and the Panama Canal. They will attend the 20th anniversary of the Panama Canal at Balboa, Canal Zone, on August 15. My Grandmother: Goddess of Love? The novel was first published in 1895; grandmother was born four years later on March 18, 1898. Is it possible that she was named after an early science-fiction/fantasy novel? I’ve ordered the book from Amazon. I’ll report on it after I read it. It can be read online (e.g. Google Books) but I still prefer paper. In the 1918 Fourth of July Parade, the men in front are the “home guard” and one of the “nurses” was Willie E. Lewis. The theme of the Fourth of July Parade that year was “all about our boys in uniform.” The home guard was for men too old for the draft. 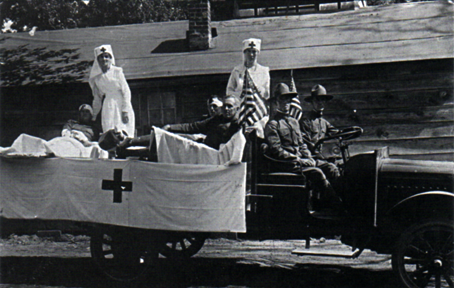 This particular float was to honor the American Red Cross in the war effort. Photo courtesy of Dr. William Felts. -- from “In And Around White County, Arkansas”, pg.23. Fifty-one years later, November 16, 1969 was designated Mrs. W. R. Felts Appreciation Day at First Baptist Church. This picture was featured on the front page of the November 13, 1969 edition of the White County Record, Volume 57, Number 45. 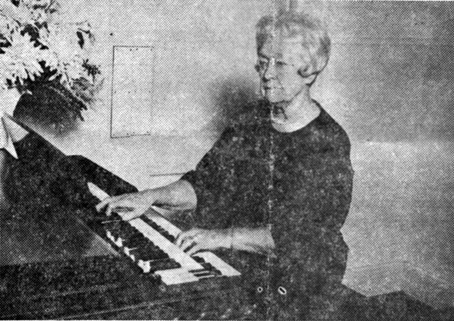 Sunday, November 16, 1969 has been designated as Mrs. W. R. Felts Appreciation Day at First Baptist Church, in recognition of over 50 yeas of service as church pianist and organist. Mrs. Felts started playing the old pump organ when she was only twelve years old. She has served her church faithfully during the ensuing years. Regardless of the circumstances, she has fulfilled her duties as organist with a devotion and dedication that has been an inspiration to all. Mrs. Felts is a native of Judsonia, the daughter of the late Mr. and Mrs. J. E. Lewis. Her life was spent in the shadow of First Baptist Church, being reared next door to the parsonage. Because of her love for music, she often used the church instruments to practice. She was married to Dr. W. R. Felts, January 29, 1920 and has one son, Dr. Billy Bob Felts, Washington, D. C.
During a revival held by Bro. L. C. Bauer of Whitehall, Illinois, Mrs. Felts joined the church and was baptized March 23, 1921 by the pastor, Bro. S. C. Vick. She has served the church graciously through the years. She has served as Primary Teacher, Junior Boys Teacher, Junior Girls Teacher and helped with the Helping Hands organization (now Woman’s Missionary Union) and Royal Ambassadors and has worked in BYPU (presently called Training Union). Through all the years, Mrs. Felts has worked with the adult choir, and has played for all church services, cantatas, special music, funerals, and weddings. All are appreciative of her efforts. Her life speaks of God’s loving grace through the dedication of one’s life dedicated to our Lord. The church cordially invites the friends of Mrs. W. R. Felts to worship with us next Sunday. Mrs. Felts will be playing for the evening worship and a time of appreciation will be held during the 11 o’clock service. Mrs. Felts will sit in the congregation as an honored guest and will be recognized by her pastor. The Funeral services were conducted last Sunday afternoon at the First Baptist Church in Judsonia for Dr. Wylie Robert Felts, who passed away in the early morning hours of November 17th, 1955, as the result of a heart attack. 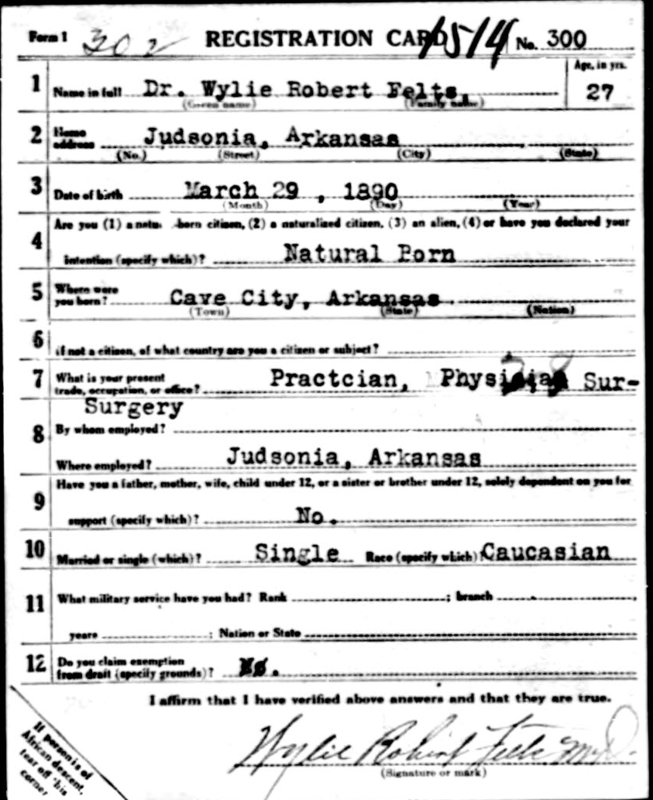 Dr. Felts was born March 29, 1887 in Sharp County, Arkansas. 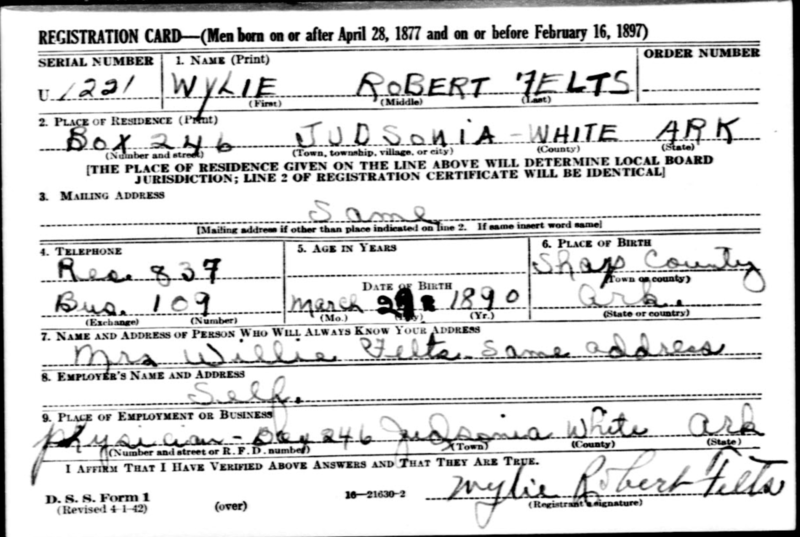 He was the son of Thomas Jefferson Felts and Almyra Felts. Although in failing health for a number of months, he continued to work through the last day. This was one of the characteristics which had been present throughout his life of service to humanity... duty before self. Dr. Felts had many facets to his life and service. Foremost of these was the medical care of his patients throughout this district of the state, and for many years he was the only active physician in Judsonia. As such he became doctor, counselor, guardian, and friend to most of those he treated. His influence and wisdom have been widely sought. 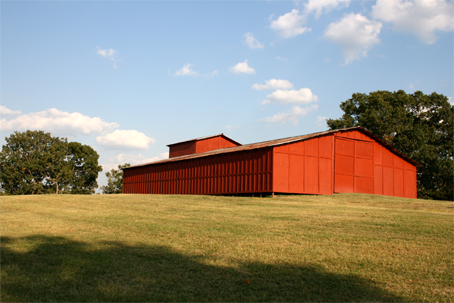 Born on a farm in Sharp County, Arkansas on March 29, 1889, Dr. Felts was the second of six children. Preparation for his life’s work was not easy for he had to struggle to complete his formal education in the Medical School of the University of Tennessee. After his graduation in 1914 he came to Judsonia as an associate of the late Dr. W. H. L. Woodyard. His ministrations to the needs of the people of Judsonia, White County, and surrounding sections of the state were interrupted only once prior to his demise, and that was the occasion of the first world war when Dr. Felts became 1st Lt. Felts in the Medical Corps and served for two years with the A. E. F. in France. He returned to Judsonia in 1919 and rapidly assumed his cloak of civic responsibility. During the ensuing years he did not shirk the demands of his profession, and his hours were gruelling[sic] and hard. Day and night he worked faithfully to bring comfort and relief to his patients, and adverse weather conditions and irregular hours were no deterring factor to the hardy young man. His assumption of responsibility for the welfare of his friends and neighbors only began with his profession, however. From a position as member of the city council he advanced in 1926 to become mayor of Judsonia, a post he was to retain for the next 25 years. As mayor he devoted his energies to multiple civic improvements and, despite the ravages of weather, depression, and time, many constructions remain as mute evidence of his civic pride. He also served as a director of the Farmers and Merchants bank for many years. As President of the local school board the best of educational facilities for Judsonia was almost an obsession with him. His interest in the young people extended beyond the school system and into the Boy Scout movement, an interest he continued to maintain throughout the years. He was at one time Commander of the Earl Rogers Post of the American Legion, which he helped organize. Membership in the Woodmen of the World, and service for years as an officer in the local Masonic lodge were his foremost fraternal interests. He was a 32 degree Mason. His interest in the politics of his town, county, district, state, and nation were renowned as he sought to strive for the betterment of his chosen land. Along this line he served as chairman of the White County Republican committee and this brought him on one occasion a citation from President Herbert Hoover. Good. Although always a man of high moral principle he did not turn to active church work until 1951. During his last years he devoted himself to this field with the same zeal, vigor, and manifestations of his basic inherent wisdom which had previously characterized other pursuits. Nothing pleased him more than to spread the gospel and Christian precepts to those who had not taken a stand for service to our Saviour. He became truly as concerned for the souls of his patients as for their bodies. The words of the eminent and famous southern physician, Dr. Crawford W. Long, which are inscribed upon his statue in the Hall of Statuary, Capital Building, in Washington, “I feel my profession is a commission from God” most appropriately also serve to describe the life and service of Judsonia’s remarkable citizen. His example to the community should long remain an inspiration, for in addition to a citizen, patriot, doctor, politician, churchman, and counselor the people of this area have been left by a very dear friend. Funeral services were conducted Sunday afternoon at the First Baptist Church in Judsonia. Rev. R. J. McMillan of Jacksonville and Rev. W. R. Woodell of the local church officiated. Beautiful solos were rendered by Mrs. J. H. Graves and Mr. Arle Queen. Mrs. McMillan played organ selections softly during the service. Dr. Felts is survived by his wife, Mrs. Willie Felts; a son, Dr. W. R. Felts, Jr., of Washington D.C. and a grandson, William Robert Felts III, a brother, Charles Felts of Clarksville, Texas and a sister Mrs. P. D. Carpenter of Batesville, Arkansas. The active pall bearers were: Jimmy Gill, Raymond Browning, J. A. Pence, Forrest Waller, W. H. Hembree and Don Travis. Internment was in the Evergreen Cemetery under the direction of Kinney Funeral Home. This is not a transcription error. The article listed both 1887 and 1889 as year of birth. It is unclear what this is. Hell is the lonely kingdom where the self is king yet only subject. Hell is the dark universe, for only the self is seen and there is no light in self. Hell is the land of eternal doubt, acknowledging only the presence of self: “I am!”, yet ever jostled by the other unseeing denizens, wailing "Aren't I?" Hell is the hungry banquet: gnashing teeth, ever gnawing, never nourishing for there is no substance to self. Hell is the firey land, burning passion desiring more but nothing more to give. I was recently turned on to Disc Golf by several men in my church and I have started trying to hit the course at Lenora Church Park at least once a week. On Tuesday, on the third hole, I held onto my tee shot a bit too long and the disc sailed wide right and onto the roof of a disc-eating barn. 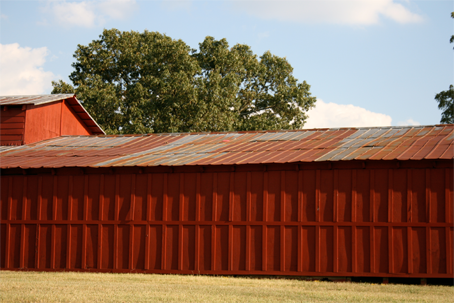 To show how bad this throw was, this next picture was taken from the tee pad facing the barn. You can see the relationship between the tee pad, barn, and goal from this satellite photo. 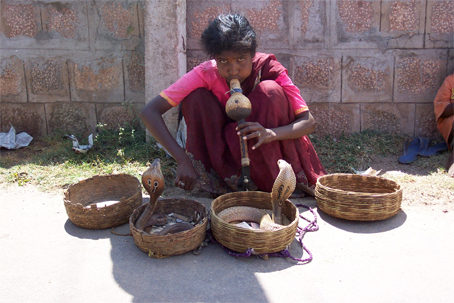 A snake charmer outside the Temple at Mysore Palace in Mysore, India. She would bat the cobras to get them to move. Observe how the snakes are “protecting” the money in the baskets. I gladly parted with a few rupees because of the quality of her performance. Having to get close to the snakes to make my contribution only added to the fun. I took this picture in late September, 2003.